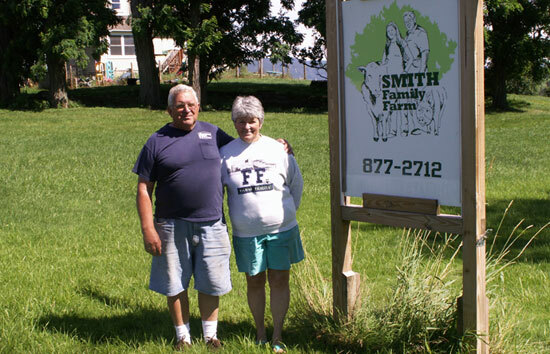 Harvey T. Smith grew up on a dairy farm, and since 1972 has owned and operated one in New Haven, Vermont, with his wife, Donna. After selling his dairy herd in 2005, Harvey has been raising beef cattle, pigs, meat birds, and laying hens, as well as growing soybean and forage crops for sale. Harvey is a 1966 graduate of the University of New Hampshire with a degree in Animal Science. He received the Vermont Farm Bureau Award for Young Farmer of the Year in 1975 and Farmer of the Year in 1992. A member of the Vermont House of Representatives for Addison County District 5, Harvey was first elected to the Vermont Legislature in 1998 and served four two-year terms on the House Committee on Agriculture and Forest Products. In 2007 Harvey was appointed to serve as Farm Service Agency State Executive Director for Vermont by the U.S. Department of Agriculture, where he was responsible for overseeing FSA’s responsibilities to farmers within Vermont and contributing feedback to assist the agency in policy decisions. Harvey returned the Vermont General Assembly in 2011. He is proud to have introduced bills for the Farm Viability Enhancement Program, Agriculture Economic Development, Vermont Department of Agriculture to Agency Cabinet Level, and Upgrades to the Agriculture Transportation Statues. Harvey continues to serve on the House Committee on Agriculture and Forest Products. Harvey Smith has been very active in a wide range of agricultural organizations on the local, state, regional, and national level since the mid-1970s. He has served on numerous boards to include the Addison County Economic Development Corporation, Addison County Farm Bureau, Addison County Regional Planning Commission, Associated Industries of Vermont, University of Vermont Center for Sustainable Agriculture, Efficiency Vermont, Vermont Dairy Task Force, Vermont 25x’25 Steering Committee, University of Vermont Morgan Horse Farm, Agri-Mark Resolutions Committee, USDA Northeast Region Sustainable Agricultural Research and Education, New England Milk Promotion, Yankee Milk Inc., Farm Family Insurance, United Dairy Industry Association, and National Milk Producers Federation, and the New Haven Congregational Church among others. Early in their married life, Donna Smith taught in the Bristol and Weybridge school systems. She gave birth to their daughter, Sara, in 1971 and in 1972 they bought the farm in New Haven, Vermont. Donna learned how to be a farmer’s wife and farmhand first-hand! She and Harvey worked together from morning milking until evening chores were done. In 1973, their daughter, Amy, was born, and the playpen, ride on toys, and the girls joined them in the barn. Amy was in third grade when Donna went back into teaching at Beeman Elementary School in New Haven, where she taught for nearly twenty-five years, before retiring in 2010. Donna’s dream had always been to have a farm where children could come, be around the animals, help to feed or water them, or just be around to pet their favorites. Now, Donna cares for children on the farm—where they have an opportunity to learn about life on a farm, “help” Harvey feed the animals, and collect the eggs. To explain the change of animals, we say they go for rides in the trailer! 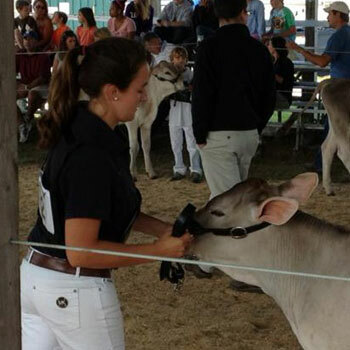 Currently a student at the University of Vermont, studying Dairy Science with a minor in Business, AnnaJo Smith is a graduate of the Dairy Herd Management program at Vermont Technical College. Her goal is to become an agricultural teacher for high school students, while keeping the family farm going. When she was eight years old she started in dairy 4-H, showing cattle and horses and attended the National 4-H dairy conference in Madison, Wisconsin. She became involved in FFA (Future Farmers of America) when in eighth grade and competed at the state, regional and national levels in different competitions that included dairy foods, ag sales and farm business. AnnaJo served as a state FFA officer for three years in a row, two of them as the Vermont State FFA President. She started to get involved with beef and vegetable production in high school, taking her first paying job at a greenhouse where she worked through high school. She raised her first beef calf from a bottle and that fall bought her first two beef cows. She has been growing her own herd slowly since then. Over the years she has worked at a horse barn, a poultry processing facility, a general store, and on dairy farms, and is currently an artificial insemination (A.I.) technician for Select Sire Power. As time permits she helps Harvey and Donna, with the family farm that she hopes one day to manage when her grandparents retire.